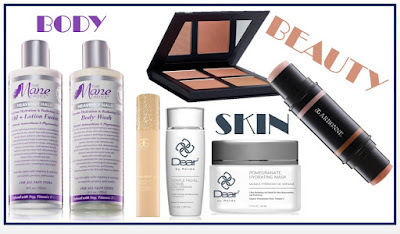 Girly Girl Giveaways: Beauty Tips to Beat the Winter Woes! Beauty Tips to Beat the Winter Woes! Here are 5 tips and some beauty products I would like to share with you as winter approaches, to keep your skin hydrated and looking its best. 1. Shorten Your Shower A hot, steamy shower can leave your mind peaceful but your body parched. Instead of stripping away natural oils limit it to five minutes, and suds up with a body wash; then, seal with an oil infused lotion. Try The Mane Choice Heavenly Halo Oil+Lotion and Body Wash set. Infused with soy and multivitamins to restore and hydrate skin by protecting against moisture loss. 2. Exfoliate Once a Week Proper exfoliation prevents the skin from developing a dull appearance - Especially during the colder seasons. Using an exfoliator once a week can provide an instantly rejuvenated skin tone. Try the Dear by Renée® Gentle Facial Scrub. This gentle gel-based scrub contains Jojoba microbeads which sweeps away dead skin cells, refines surface texture and helps decongest skin. 3. Shine On Bring a little magic to your complexion by dabbing a shimmery cream highlighter onto the cheekbones, inner corners of your eyes, and brow bones. To draw out the warmer tones in darker skin, opt for a gold shade. If you're fair, pink tones will impart a natural glow. Try Arbonne Starlight Glow Palette which contains an array of warm to cool powder pigments or Arbonne Sheer Glow Highlight Stick multi-purpose highlight stick containing a Pearl shade to highlight and Bronze to give an effortless glow. 4. Keep Up Your Daily SPF Habits It might be tempting to stash your sunscreen away until next summer, but it's necessary to wear year-round if you want your complexion to look its best. Slather on the SPF 365 days a year for skin that's healthy enough to glow naturally! Try Arbonne RE9 Advanced Restorative Cream SPF 20 Sunscreen. The concentrated formula protects against UVA/UVB rays and contains collagen-supporting ingredients! 5. Don't Fear the Mask! Hydration masks are a key to giving your skin the nutrients it craves in order to reveal an enviable glow! Try Dear by Renée® Pomegranate Hydrating Mask. The unique gel-based formulation leaves skin super moisturized and glowing with Aloe Vera Leaf and Mushroom Extracts to nourish and soften skin. Now throw on a cute pair of boots and your softest scarf and enjoy the cold weather worry free!